Prince nymphs are very productive flies in Colorado so it’s a good idea to have a supply in one’s fly box at all times. 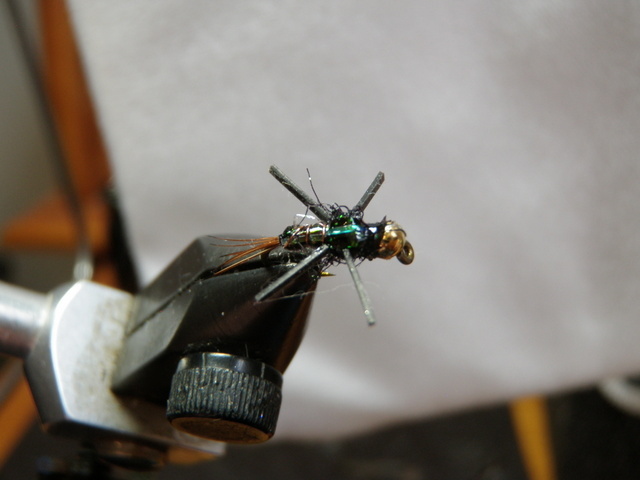 Unfortunately I do not enjoy tying these peacock body flies probably because of the temperamental white goose biots that never seem to cooperate when I mount them behind the bead and on top of the body of the fly. The splayed goose biot tails can also be frustrating, but I’ve improved my ability to attach these after watching a YouTube video. I’ve had the most success with prince nymphs on the Arkansas River in April and May after the heavy caddis hatch arrives, as I believe the peacock body and white wings mimic egg laying caddis adults as they dive to the river bottom. 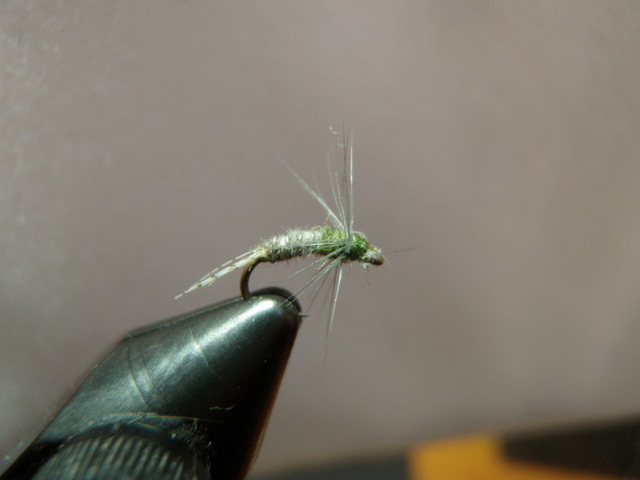 I recall quite a few outings where caddis pupa and dries were not producing so I knotted a prince nymph to my line and began to enjoy some fairly fast action. Several winters ago I was paging through my Scott Sanchez fly pattern book, and I discovered his ultra zug pattern, so I decided to give it a try. 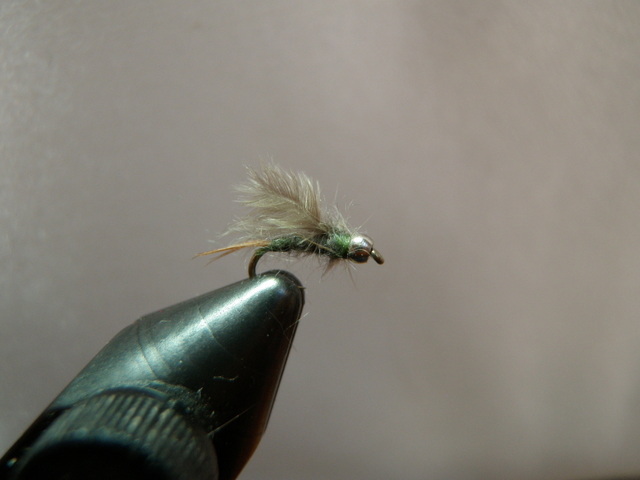 This pattern is a much simpler fly, but it retains the peacock body and presents a very shaggy buggy look. 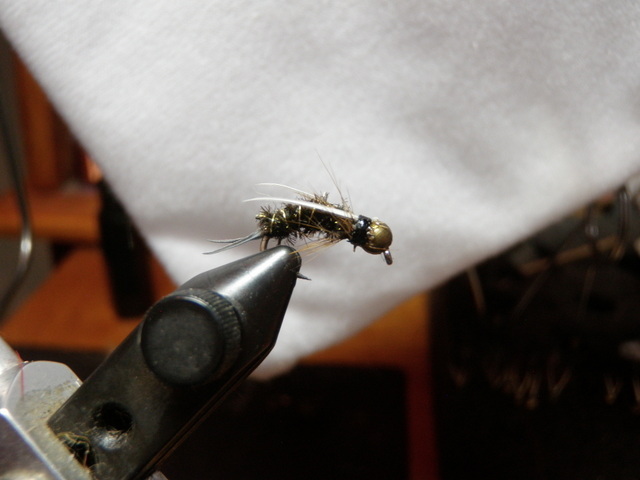 During visits to the Arkansas in the spring of 2012 and 2013 I substituted the ultra zug for the prince nymph in caddis egg laying situations, and I discovered that it worked quite well. As I planned my tying for 2014, I decided to produce more ultra zug flies and skip the more time-consuming prince nymph. As I prepared to tie ultra zugs I went through my canisters of damaged flies and set aside seventeen prince nymphs in varying states of disrepair! 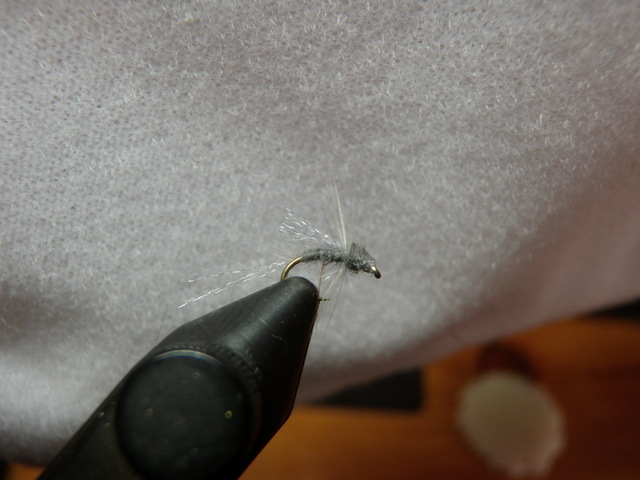 This is probably an indictment of my prince nymph tying capabilities as many were missing one or both of the white goose biot wings. I spent a few hours reconstructing these wounded prince nymphs on Saturday, and I now have some of the real thing in addition to the scaled down ultra zugs. Perhaps this spring I can perform some tests and alternate between the two peacock imitations to see which one delivers the best results? The copper john came into vogue as a hot fly perhaps 15 – 20 years ago, and I jumped on the bandwagon and tied a batch at that time. They proved to be quite effective, and I can remember some hot fishing in the pocket water of the Eagle River with a copper john being the primary target of some nice brown trout. I attached the copper john to a yellow Letort hopper using a three foot dropper, and the fish gobbled the shiny nymph like candy. Aside from the flash of a copper john and a generally fishy look, they are also appealing because of their rapid sink rate particularly when used as a dropper in a dry/dropper arrangement. 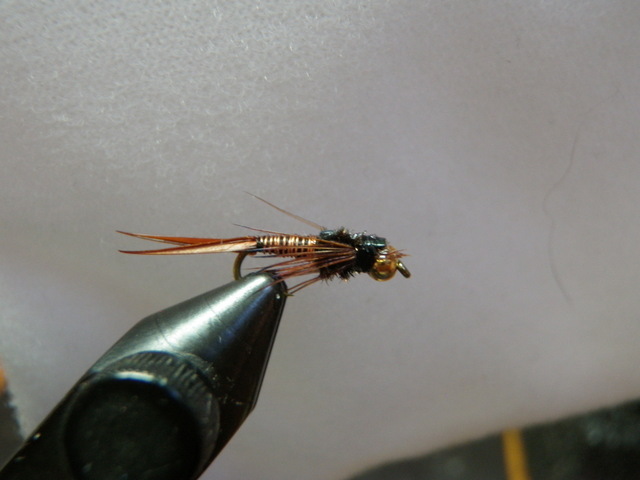 I tie some of my copper johns with lead wire wrapped behind the bead, and when combined with the copper wire abdomen and the bead, this fly sinks quickly upon entering the stream. The flash of the wire abdomen, the bead, the peacock herl thorax and the flash on the wing case make this fly difficult for trout to miss. For some reason I’ve strayed from using the copper john in recent years and consequently I have not needed to replenish my supply. As I prepared for my trip to Argentina; however, I realized that I was down to nine relics from the copper john heyday so I decided to replenish my stock. I dug through my fly pattern binder and found the John Barr materials list and tying instructions and quickly got in the groove of producing a fresh supply. After generating ten brand new copper nymphs I found four more in need of refurbishment. I was able to salvage the copper wire abdomen and reconstructed the thorax, legs and wing case on these unraveling flies. I feel comfortable with my 2014 supply now, and I plan to test the effectiveness of this solid standby particularly early in the season. Perhaps one of the easiest flies to tie is the zebra midge. I had 13 of these small flies in stock so I decided to tie an additional 7. I completed this project in less than half an hour as the most time consuming part of the process is centering the tiny bead over the point of a size 20 hook and sliding it around the bend to the hook eye without dropping the bead or the hook on the floor. Because these hooks and beads are so tiny I clamp the hook in my vice in a backwards J position and use my tweezers to grab the bead and position it over the point of the hook. I always try to hold my hand beneath the hook in case I miss because if one of these falls to the carpet, it is goodbye bead. Once the bead is on the hook, I simply attach my black thread to the hook and then attach a length of fine silver wire. I wrap the thread up the hook shank making sure that the metal is covered and at the same time creating a gradual taper. Once I’ve covered the hook shank, I wrap the fine silver wire forward to form a rib and then tie it off just behind the bead. The final step is to whip finish behind the bead and this creates a bit of bulk that imitates the head. The zebra midge is a fly I should probably fish with more frequently. I fall into the trap of thinking that the fish cannot see such a tiny morsel drifting in the current; however, I must say that on the occasions when I’ve used one, I’ve had a fairly high success rate. Generally I’ve used a zebra midge in the morning before I observe larger insect activity, and it has produced fish. I can remember instances on the Frying Pan River, Big Thompson River and Arkansas River where I’ve added a zebra midge to my line and experienced some success. I’ve added it as the point fly on a two fly nymphing setup with a strike indicator, but more success has resulted from using it as the second fly below a buoyant attractor with a larger nymph above it. I seldom fish lakes, but I’ve also had good luck with a zebra midge dangled off a Chernobyl ant or similar large attractor when I’ve noticed adult midges fluttering above the water. Hopefully I’ll recognize midge situations during 2014, and the zebra midge will serve me well. I was probably nine or ten when I would sit in our living room in Boyertown, Pa. and watch a sporting event with my father. Although it is now fuzzy in my memory, I seem to recall we were watching a football game together, and I asked my father which team he was rooting for? He replied with the name of the team he favored, and I followed up with the inevitable question, “Why?” Dad paused and replied, “Because I like rooting for the underdog.” That brief experience molded my character forever going forward, and while it has often resulted in frustration and sadness, it also forms a fundamental foundation for what drives me through many life experiences. I’m nearly always a fan of the underdog. This preference for the underdog has carried over beyond sports teams to the business arena. One reason I love to read the Wall Street Journal is to follow businesses and corporations in their journey through the ebb and flow of financial success and failure. I particularly love the in depth features that delve into the fabric of companies and the strategy and thinking that makes them what they are. This all brings me to another underdog story and how it touched my life. In my younger days because of my red hair I could get away with shaving every other day, but for some reason, as I’ve aged I’ve been forced to follow the shaving ritual on a near daily basis. Fifteen years ago I purchased a Gillette Sensor Excel razor, and I’ve been using it faithfully ever since, but the price of replacement blades has been an ongoing irritant. For a while I discovered some cheaper generic Kroger two blade cartridges, and kept a supply of these in my drawer to partially temper my frustration with high blade prices. I also received a free supply of disposable razors from a previous neighbor and my brother, but I discovered that these dulled quickly, and I didn’t like the light plastic feel. In order to prolong the interval between the agony of purchasing overpriced twin blade cartridges I resorted to using one cartridge for three to four weeks before replacing. Only when it was necessary to drag the dull blades over the same difficult patches of stubble on my face multiple times, did I take the plunge and buy a new pack of replacement blades. This cheapskate approach to shaving served me well until the last year or so, when after a remodeling of the local King Soopers, I discovered that they no longer stocked the generic twin blades. I gritted my teeth and purchased a five pack of Gillette twin blades for an obscene price in excess of $20, and I milked these cartridges for six months. Unfortunately I inserted my last cartridge from this pack into my razor a couple weeks ago, and when I visited the local supermarket discovered that their buyers no longer stocked twin blades of any sort. What was I to do now? I needed to either purchase the ridiculously overpriced and over engineered four blade cartridges or even worse a six blade system, or find an alternative source for my ancient twin blade razor. Enter the internet. I fired up my browser and began searching online for generic twin blades, and I discovered that Amazon offered five packs for roughly $17, and I filed this information in my memory banks while I continued to search for alternatives. $17 for five cartridges equals in excess of $3 per cartridge, and in this day of inexpensive flash drives with gigabytes of storage, I refused to believe that someone could not manufacture a decent twin blade cartridge at a lower cost. In fact, I thought to myself that there might be a business opportunity to manufacture replacement blades and offer them to the marketplace at a slight discount off the prices charged by the market leaders, Gillette and Schick. I decided to defer the purchase until I could do more research, as I was convinced there was a better deal. This research took place on a weekend, and the following Monday morning when I started up my computer at work, I noticed a link to a story about Dollar Shave Club. I thought it was ironic that this popped up in the same time frame that I was searching for a razor blade deal, so out of curiosity I clicked on the link and the browser took me to a page featuring a video. I plugged in my earbuds and clicked the play button and was entertained by a fast paced “in your face” style of ad for Dollar Shave Club. I was now very curious so I transferred to the Dollar Shave Club page and clicked on the offer and then chose the humble twin option. Dollar Shave Club was offering five twin blade cartridges per month for $1 plus $2 shipping for a total of $3 per month. I did some quick math and estimated that I was buying 2.5 packs per year or 12 cartridges at a price in excess of $20 per five pack so this equaled an annual razor blade cost of close to $50. The Dollar Shave Club deal would cost $36 per year, and five blades per month meant I could replace my cartridge every week. The deal seemed very inviting, but I searched on Dollar Shave Club reviews and read four or five accounts to assure myself that the company was legitimate and the blades were good quality. Nearly all the reviews verified the quality and confirmed the legitimacy of Dollar Shave Club, but I still waited another day before placing an order. On Tuesday I decided that I would make the plunge and joined the club. Unfortunately there was a glitch with the web site order process, so I had to chat online with a customer service representative, but eventually my order was placed, and I could see it on my club membership page. With this task now out of the way, I was fascinated by this new entrant into the shaver market, and I wondered how the underdog was faring. I did some more online research and discovered that Dollar Shave Club began offering their service in April 2012. At the time of the Dollar Shave Club launch Gillette held 80% of the razor market and Schick trailed at 18%. Simple math told me that the two big guys comprised 98% of the razor market. I began searching for information that updated the razor market share to 2013 numbers to see if the underdog Dollar Shave Club was making any inroads, but unfortunately I was unable to uncover any new information. 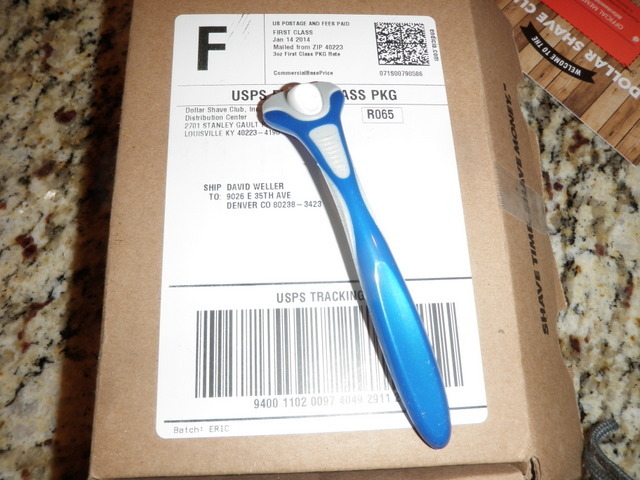 I did, however, find some interesting articles that critiqued and applauded the Dollar Shave Club strategy, and one of these identified the manufacturer of the blades offered by DSC. I checked out the source and found that I could buy bulk packs of blade cartridges directly from the supplier of DSC for under $1 including shipping. I decided to remain in the club for six months to see how the service pans out, but perhaps eventually switch to buying direct from the supplier. 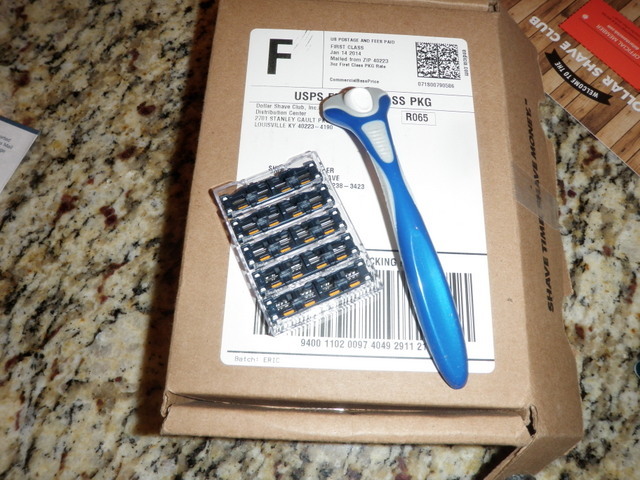 When I checked the mail after my run on Thursday I found a small cardboard box and quickly carried it back to the kitchen where I opened my DSC razor and pack of five blades. I’m happy to report that I’ve now used the razor twice, and it delivers comparable shaves to a new Gillette cartridge. The razor itself is all plastic and it makes small squeaking noises as it shifts across my face, but it is certainly adequate for a light beard like mine. I’m still pulling for the underdogs to make a dent in the razor market. My dad cheered the underdog, and I will follow in his footsteps. Lovers Leap. It is visible from the chair as one ascends the Blue Sky Basin area at Vail, and ever since Blue Sky opened in 2000, it gnaws at my total being when I gaze upon it for the first time each season. It must have something to do with being a man, or perhaps in more recent years it is a test of the aging process. A ridge runs along the top edge of a bowl just beneath the chairlift, and the wind whips across the high flat surface and deposits snow in a fifty yard long cornice. In big snow years such as 2014, the snow curls around the rock ledge that forms a rim on the bowl, and that creates a beautiful curved overhang and beneath the curling lip lies the steep face of the bowl which looks nearly vertical as one gazes over the edge. The best comparison to a cross sectional view of the overgrown 2014 cornice would be the overhang of a muffin top; the type where too much batter was poured into the pan and the top spills over the muffin paper by a half inch or so. There we stood on Friday, January 17, 2014. Fred Young was with me, and we contemplated taking the plunge. It was a rite of passage each season, but could I generate enough courage to do it again on this my third day of skiing in the new season? We worked our way down along the ridge and bypassed the upper portion where not only is the bowl steep, but also populated with numerous large boulders to make the adventure even more dicey. Fred and I did display a smattering of good judgement as we slowly skied further down along the ridge to a slight trough ahead of where the flat edge rose slightly. I stopped a couple times before this point, but I couldn’t even look over the edge to inspect the bowl beneath because the cornice was very wide and curved, and I could envision myself breaking off the snowy lip and tumbling down the concave half pipe in a ridiculous display of bad judgement, so I followed Fred to the obvious entry point. There were numerous ski tracks at the low point of the rim, so it was now a matter of summoning the courage to point my skis down and taking the plunge. Fred was just above me, and as is typically the case, he dropped off the lip first and streaked down the bowl while kicking up a plume of snow. My heart raced and my breathing quickened. It was now or never. I couldn’t summon the nerve to actually jump and catch air so I simply dropped off the lip and instantly gravity sucked me down the hard-packed and wind-blown surface. It was an exhilarating five seconds as I made a quick series of jump turns and controlled my speed as I zig zagged down the steep slope just above Fred. We continued on our way creating tiny snowball avalanches until we gathered our bodies and senses thirty yards below the rim. I’d done it! Once again the prospect of the thrill and exhilaration overcame the inner fear, and I conquered Lovers Leap. Upon finishing the salvation nymph supply, I reviewed my fly tying to do list and noticed that the next patterns were RS2’s and soft hackle emergers. These are both very productive flies in Colorado during the spring and fall BWO hatches. I’ve had days when trout tune into these subsurface imitations like kids tune into candy on Halloween night. I can recall several occasions when I spotted only a handful of adults in the air, but the fish hammered subsurface nymphs and emergers. Apparently the nymphs get active but do not always emerge on the surface, and the fish notice this. 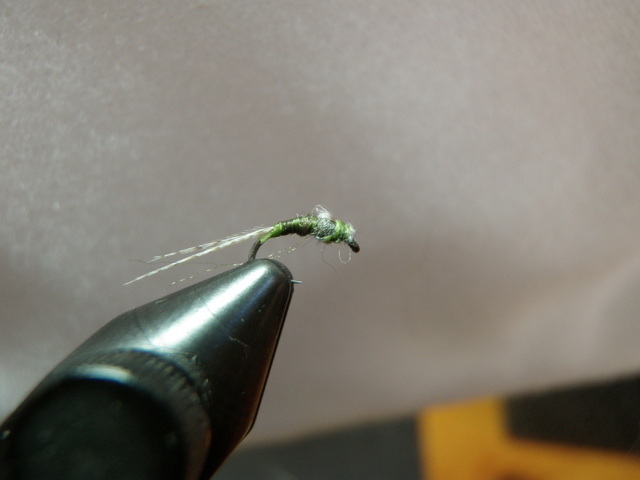 The RS2 has historically been my most productive baetis nymph imitation, and I’ve gradually evolved to tying all of them with a tiny nickel bead behind the eye. This added weight allows me to fish the RS2 as a single dropper beneath a buoyant attractor, although I sometimes fish it as a third fly on the point with a larger beadhead nymph in the middle position. There are also many times when the dry/dropper does not produce, but fishing a deeper nymph rig with a strike indicator does the trick. The RS2 is also productive in these instances as the point fly. I suspect this method excels when the nymphs are swimming up from deeper in the water column. Once I completed the 15 RS2’s according to my plan, I found another ten that were in my refurbishment supply, and I made them as good as new. In addition, I retrieved 9 teal baetis nymphs and 8 WD40’s and refurbished them as well. 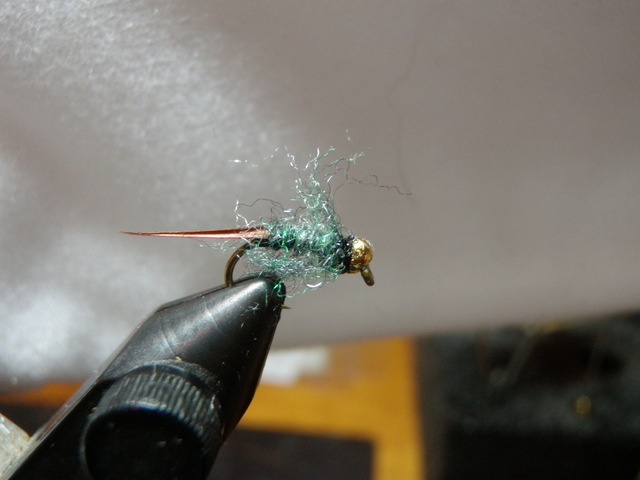 These two patterns also imitate BWO nymphs, and I’ve had occasional success with them. 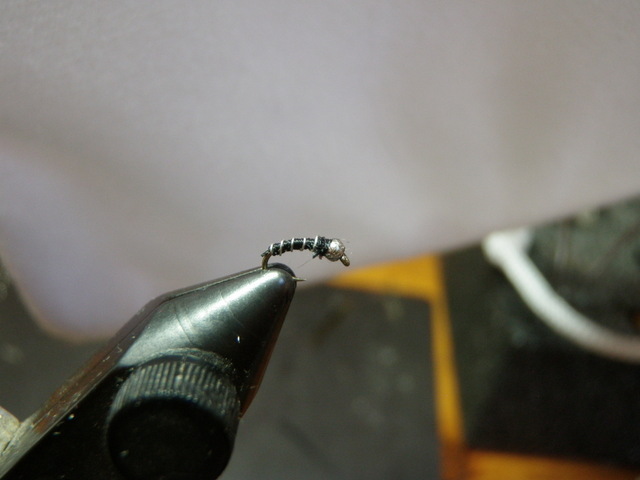 The WD40’s present a very narrow profile and seem to produce best when extremely tiny mayflies are visible in the air. The final pattern that I tied in this BWO genre was the soft hackle emerger. This pattern caught my eye when I spotted it in Charlie’s Flybox, and I made a few two winters ago and then experimented with them successfully during the summer of 2012. Given this success I stocked up on more for 2013, and they became much more of a mainstay on my line. In fact, I began going to the soft hackle emerger before the RS2 in many situations, and I was not disappointed. 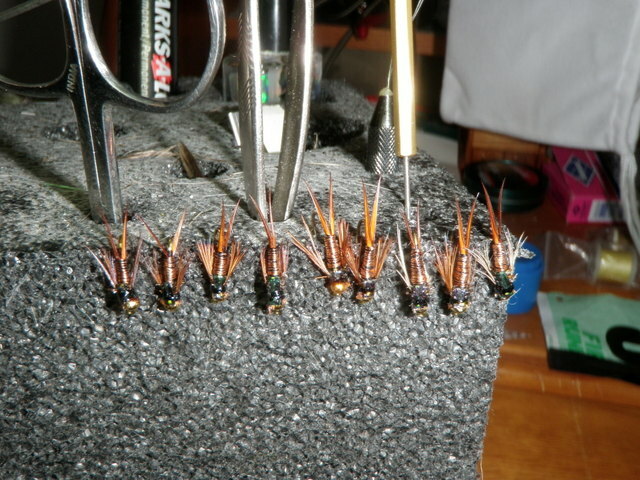 After tying nine additional soft hackle emergers, I enter 2014 with 50 at my disposal. This is indicative of my confidence in this new addition to my arsenal. 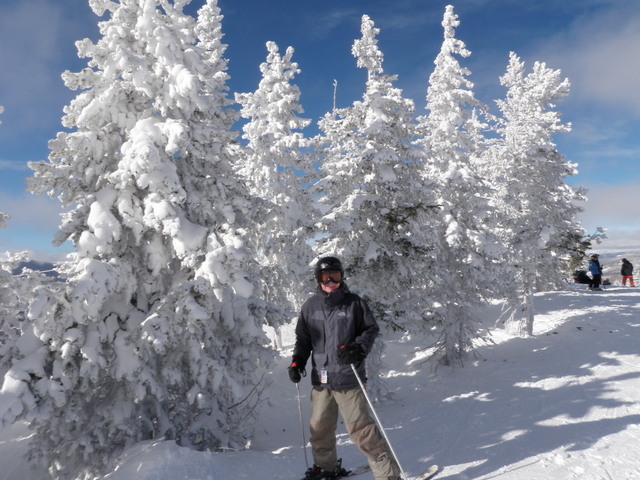 What would you get if you combined Vail ski area, 10 inches of fresh snow, blue skies and sunshine, and a Saturday? You’d get an extremely crowded mountain, but a great day of skiing nonetheless. Jane and I reserved a condo in Frisco at the Mountainside complex for Friday and Saturday night, January 10 and 11 so we departed Denver at 6:30PM on Friday night expecting to avoid the traffic congestion on I70 on Saturday morning. Unfortunately it was snowing heavily from Georgetown all the way to Frisco resulting in stop and go driving from mile marker 220 through the Eisenhower Tunnel. We didn’t reach Silverthorne until 9PM when we stopped for a quick dinner at Chipotle, and we finally arrived at our condo by 9:30. Our unit was on the third floor so that required several trips with our belongings, and consequently we didn’t get to bed until 10:30. The heavy snow was unfortunate for driving but well received by skiers. 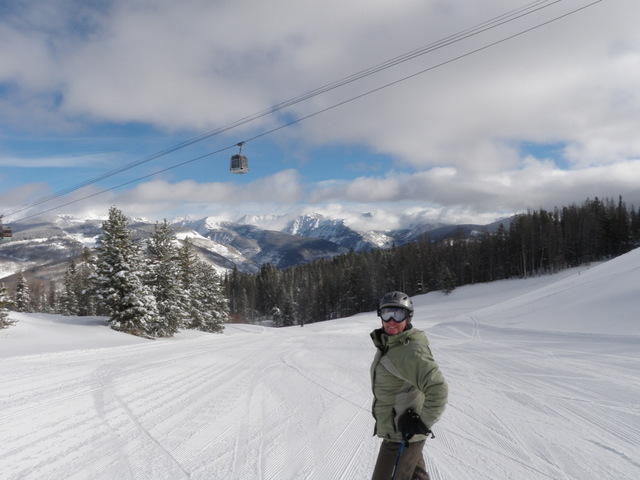 Because of the exhaustive travel on Friday night, Jane and I didn’t wake up until 7AM on Saturday morning, but when I checked the ski reports I discovered that Vail received 10 inches of new snow. We hustled to eat breakfast and make up for lost time, but the best we could do was leave Frisco by 8:30 and arrive at Vail by 9:15. By the time we waited in the line to enter the parking garage, put on our boots and ski clothes, hiked to the chairlift and rode to the top of Born Free lift it was between 9:30 and 10:00AM, and we could see that most of the powder below us was already chopped up. We’d largely missed out on a rare powder day at Vail in spite of lodging only 45 minutes away. In spite of the missed opportunity we made the best of our day, and it was spectacular nonetheless. We found some powder caches on the front side and then worked our way across the mountain to Two Elks Lodge for lunch. We learned from several friendly skiers that Blue Sky was a zoo, so we stayed on the front side in the afternoon and had some outstanding runs on Blue Ox and Ouzo before concluding our day on Born Free. The high temperature climbed to 30 degrees and the sky was a perfect blue. 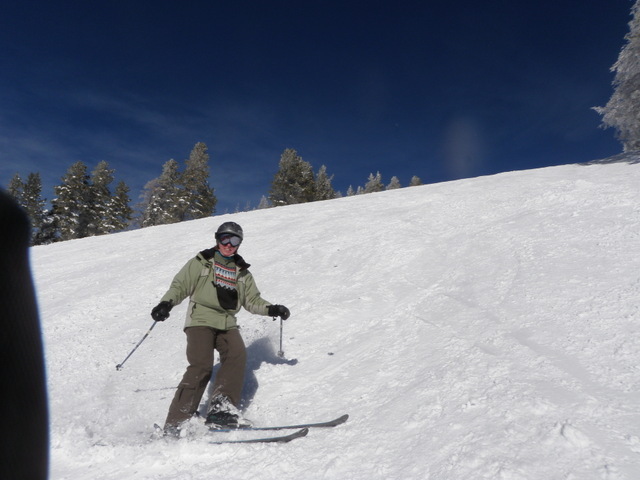 Even after the powder was tracked out, we enjoyed soft packed fresh snow and gentle moguls. One of the highlights of the day was getting acquainted with a nice family of four from Mexico City that joined us at our lunch table. The family consisted of a husband and wife with a 15 year old son and 13 year old daughter. Jane and I struck up a conversation with the kids while the parents were getting their food in the cafeteria, and we were very impressed with their mastery of English, and their poise when talking to strangers. I gave the mother my business card, and we hope to exchange contacts and stay in touch. The first day of skiing for each season is always a mixture of feelings for me. On the one hand it is reassuring that I am still able to slide down a hill on narrow boards and control my speed. There is something liberating about achieving relatively high speeds on the steep slopes of the Rocky Mountains without the aid of an engine or source of propulsion other than gravity. Of course the clean cold mountain air and the spectacular scenery are additional draws. However each year as I grow older I wonder if the sport of downhill skiing will finally stress my muscles and joints beyond tolerable levels. December was quite busy with our trip to Argentina and then playing catch up with Christmas preparation and then the last week spent doing fun activities with my family. Once January 1 passed, however, my thoughts began to turn toward the ski slopes. 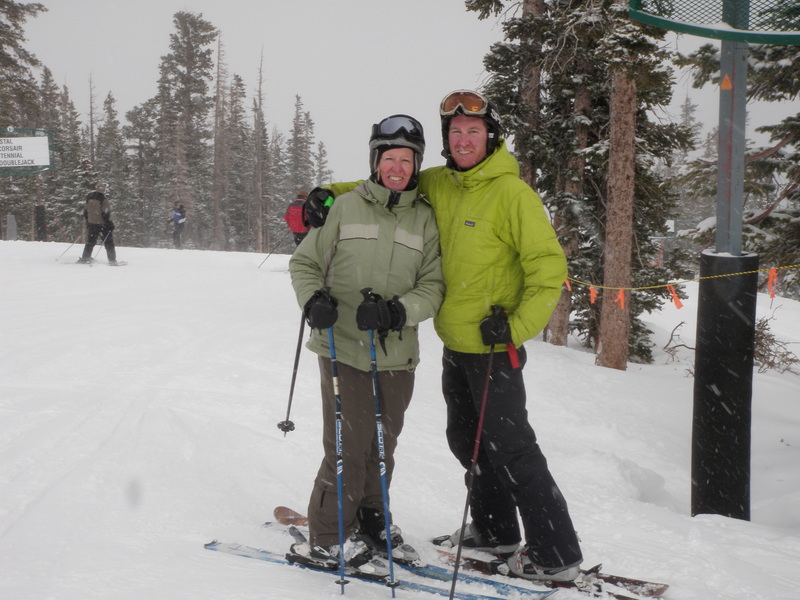 The 2013-14 season in Colorado got off to an encouraging start with reasonable snowfall in the mountains, and the ski areas available to Jane and I on our Epic Colorado pass averaged snow depths of 35-40 inches; quite favorable accumulations for early January. 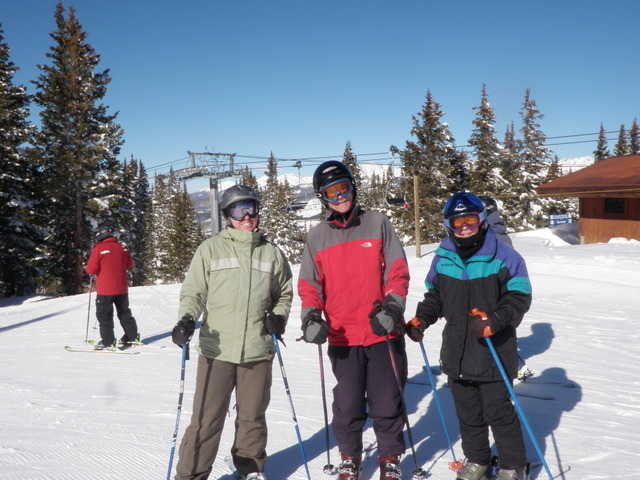 My son Dan was home for term break and did not return to Fuqua Business School until January 9, so Jane and I planned a ski day for Wednesday January 8. We debated between Vail and Breckenridge as our destination, but finally decided on Breck during our drive west on Interstate 70. The ski application on my phone indicated that Breckenridge received the most new snow in the past 24 hours, five inches, so that pointed toward Peak 8. In addition, Breckenridge represented a shorter drive and a new area, Peak 6, had opened and beckoned us with new terrain to explore. It turned out to be a good decision as five inches of new snow greeted us, and we managed to glide over some untracked powder during the morning. Even after the fresh snow got tracked out, we discovered a nice soft packed base on all the peaks. Because it was midweek, we did not experience long lift lines, but one negative factor was the frigid temperatures and wind chill. The high temperature for the day probably never reached twenty degrees and the sky was mostly overcast with off and on periods of snow. In order to keep my toes warm I used two packs of toe warmers. In spite of the cold temperatures it was a fun day as I broke in my quad muscles with several mogul runs. Dan branched off on some expert terrain several times while Jane and I stayed mostly on intermediate slopes with a handful of black diamonds to get our hearts pounding. Judging from the soreness of my quadriceps on Thursday, I certainly tested my muscles to the fullest, but I’m already looking forward to another day on the slopes of Colorado. When I posted my last report on the salvation nymph a year ago around this time, it was mainly an experimental fly. I’d caught a few fish on it, but there were other flies in my arsenal that spent more time on the end of my line. After another year of fly fishing I can report that the salvation nymph has improved its ranking among the various flies in my box. There were several occasions during the year when this fly came through in a big way, so I decided to replenish my supply for the coming season. I counted 13 in my large storage box plus a few in my fleece pouch so I decided to tie an additional 19 to bring my inventory to 35 entering the new season. Upon my return from Argentina and after taking a break during the holiday season, I returned to my fly tying desk with the start of 2014. I finished tying my supply of beadhead hares ear nymphs and launched into salvation nymph production tying mode. I followed the steps outlined in a previous blog post and completed the nineteen according to my plan. Similar to the hares ear nymph I added several additional points where I applied head cement to hopefully prolong the life of the fly before the thread unravels. Once I’d completed nineteen new flies I searched through the four or five canisters of unraveling and damaged flies on my desk and discovered four or five in need of repair. I refurbished these and brought my total stock to 40. Hopefully these will serve me during the coming year as I intend to use the salvation nymph even more frequently than in previous seasons. I love the look of this attractor nymph with numerous points of light reflection including ice dub, pearl flashabou, and flash back black.